VOGUE CONSTRUCTIONS WILL PARTNER WITH YOU THROUGH YOUR CUSTOM RESIDENTIAL BUILDING PROJECT. AT VOGUE WE WILL GUIDE YOU THROUGH THE BUILDING PROCESS FROM CONCEPT TO COMPLETION. Project management is what we do best, so we work with you on your custom house. Vogue Constructions is a small to medium domestic construction company. We specialise in new homes, knock down rebuilds, renovations and extensions. Vogue Constructions commenced trading in May 2003, by its two directors Nathan Toscan and Stuart Sampson. Since then we have built a reputation for constructing high quality architectural new homes and renovations. 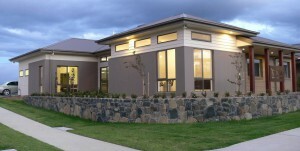 In 2007 the MBA and HIA awarded Vogue Constructions the prestigious award of house of the year. Over the years we have been successful in winning numerous awards for our projects, refer below for a detailed list. Vogue Constructions has a reputation for providing clients with excellence in building projects and have shown our commitment, passion and knowledge time and time again. The expertise of our highly experienced and qualified staff enables Vogue Constructions to offer a competitive and professional service, adapted to meet the specific needs of each project. Vogue Constructions provides high quality, professional services to the residential market. We operate across the ACT and surrounding NSW. Our experienced staff provide total project solutions for any size project. Vogue Constructions combines strategic management tools with the ability to procure the best subcontractors and suppliers. Our thorough understanding of the industry ensures effective management of client project cost objectives. Vogue Constructions are a motivated team of professionals who ensure all clients are provided with a quality service second to none. Our experienced project team can deliver total solutions for any project. Vogue Constructions employees and contractors are fully qualified in carrying out works to the relevant Australian Standards and all other regulations covering the construction industry. Vogue Constructions is focused on providing professional service to every client at all times. Vogue Constructions motivated team draw on a wealth of experience to deliver high quality services to suit the needs and values of each individual client. Every project is carefully planned and controlled to maximise client satisfaction on completion. Our highly motivated team is receptive to your needs and can tailor the delivery of our services to suit your requirements. Vogue Constructions is driven by the principles and ideals of Quality. We implement a quality management system that complies with quality standard AS/NZS ISO 9001:2000. The system identifies our objectives and how we measure the results of our performance against these objectives. Our projects are thoroughly planned and backed with a strong focus on quality control. Vogue Constructions is dedicated to delivering results on time, within budget and to the highest quality standards available. Vogue Constructions has a strong commitment to developing a continuous improvement culture which, in turn, forms the foundation of our business relationships with our customers, suppliers and sub-contractors. Vogue Constructions is committed to providing a safe workplace for all employees, clients and visitors. A detailed Occupational Health & Safety and Environmental Management plan is prepared and implemented for each project. Vogue Constructions encourages a safety awareness attitude and provides Occupational Health & Safety and Environmental Management training, while exploring potential improvements within management systems. Vogue Constructions is committed to continue managing its operations in a manner which strives to achieve sustainable economic development whilst protecting the environment and safeguarding the health and safety of employees and the community. Vogue Constructions are multi award winning builders, winning numerous awards since the company was established. Including both the HIA and MBA Home of The Year.